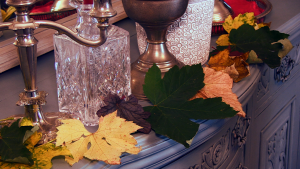 This is my post about how to make autumn decorations for the home. If you can’t see the video click here. Autumn is the most beautiful time of year to me. It never fails to leave me speechless with all those gorgeous colours everywhere. Does anyone else agree that it’s been more sensational than ever this year? I really feel like we’ve had more golds and yellows than ever. Well I love to recreate the glory of the outside world in my home. 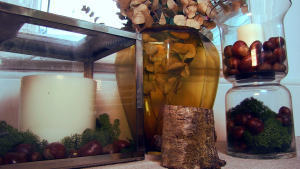 So I thought I’d share a few of my tips for decorating the home in autumn. Leaves create the magic of this season, and let’s face it there’s no shortage of them. I like to collect them and string them together as garlands. You can place them on shelves and mantelpieces or hang like bunting. Pick an array of colours for maximum effect. Ok so they don’t last, but they look good for most of the season. If you want them to stick around longer you can spray them with varnish or why not use gold or silver spray paint them – they can double up as Christmas decorations. Another neat idea if you have people coming over to dinner is to pick out some really special leaves and tuck them into the napkin rings. Red maple/ acer leaves can look particularly striking. We’ve come to associate pumpkins with Halloween, but I think that’s underselling them. You can buy a huge pumpkin for just a pound and there you have a gorgeous, bright decoration in itself. 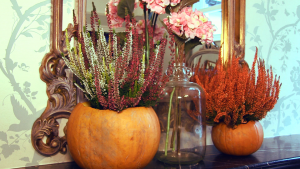 Hollow one out and place seasonal plants like heather inside for a beautiful, rustic, autumnal decoration. Just be warned that if you leave it for too long it will go a bit funky – I know this from bitter experience! For me though they are the perfect decoration. I find they work well in vases and lanterns, particularly if you mix them with some moss to get that true feeling of bringing the outside in. Just make sure you do leave some for the animals! So next time you’re admiring the autumn colours when you’re out for a walk, think about how you could recreate that inside to bring the same smile to your face when you’re at home. And that’s how I make autumn decorations. If you love going out for walks during all seasons, ever thought of picking up litter as you go? Check out the video from when I did a sponsored litter picking marathon for Children in Need.